It’s been years since the gold and silver topped out in 2011. We have been waiting for a new bottom form and a new bull market to emerge for nearly 8 years. In this article, I’m going to compare palladium, gold, platinum, and silver and show you which of these precious metals I feel is the best long-term investment and also the best trade for 2019. The analysis presented below is based on technical analysis using previous significant highs, and Fibonacci extensions. Both of these techniques work exceptionally well for predicting price targets both to the upside and also price corrections to the downside. If you have never used Fibonacci retracement or extensions in your trading I highly recommend learning more about them. I have no doubt it will improve your market price projection targets for your investments. I have found this technique to be the number one best trading tool for projecting future price movements in all asset classes. The charts below will show to price forecasts for each metal. The first price target is based on the previous significant high that price made between 2000 and the current timeframe. Previous significant highs are typically the first target for the price to reach and that is also our first major upside target for these metals. The second price target I use is based on Fibonacci extensions using stand out lows formed anywhere between 2002 to the current price time and projecting that forward into the future beyond the previous highs shown on the charts. So let’s get started with the worst precious metal to invest in and work your way down to the best precious metal. Palladium, In my opinion, is the worst precious metal to own for 2019. While palladium is used in everything from dentistry to groundwater treatment, Palladium is by far the most versatile precious metal. Only a little while ago palladium was not nearly as popular as it is today due to the incredible economic growth in developing countries especially China. This multi-use metal is steadily growing its importance in the markets hence the strong performance to date. 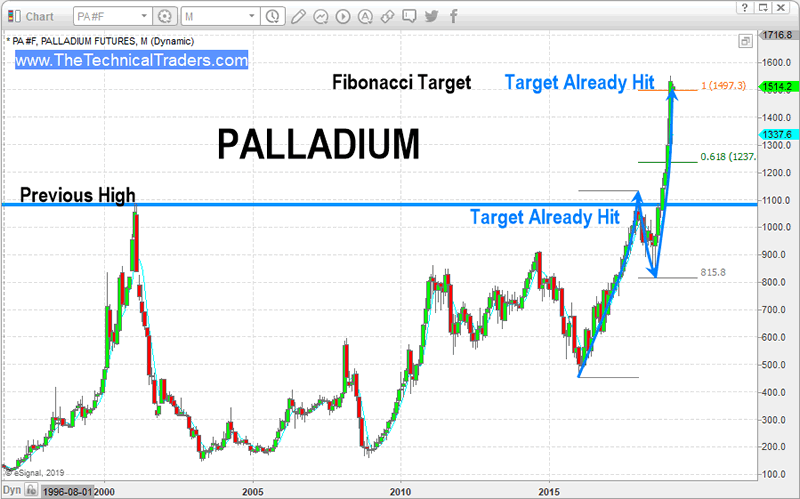 There is no doubt that Palladium has staged a massive rally from the 2009 lows and also another mega-rally from the 2016 low. 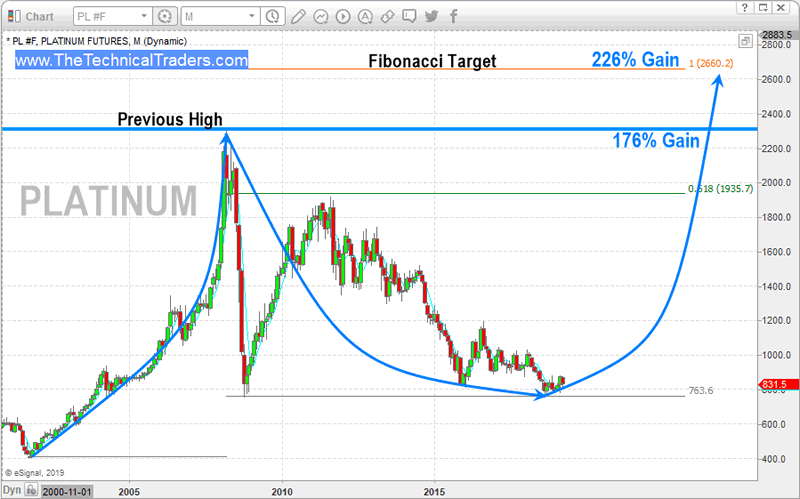 But, knowing the best performing investments eventually become the worst performing investments later, let’s take a look at the chart of Palladium and see why I feel as though Palladium is the worst investment metal for 2019. The monthly chart of Palladium below shows the previous high in price in the year 2000. That high has been broken and now the price has gone parabolic blasting above that level to the 1550 mark. At this point, the previous high target has been breached and we no longer see that as a price target. There is zero upside potential based on the previous high. The second price target is based off the lows in 2016 using the Fibonacci extension the pullback in 2018 followed by this recent rally. This gives us a price projection of nearly $1500 an ounce. As you can see this perfect bull flag (continuation pattern) has reached the hundred percent Fibonacci measured target of 1500. Therefore I see this upside move as being complete and it is more likely to pull back and correct in 2019 with 0% upside potential. Anything beyond this price level is a bubble which could burst at any time and carries a high level of downside risk. Gold is the second worst investment for 2019 when it comes to precious metals in my opinion based on potential upside growth. Keep in mind I am very bullish on the price of gold looking forward but other metals definitely have a lot more profit potential than gold. As you can see on the monthly chart of gold the previous high was about $1900 in 2011. 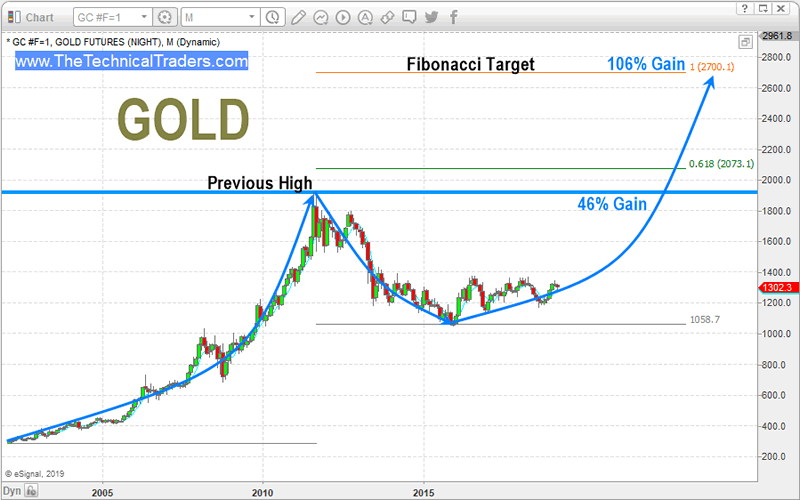 That level is our first price target for gold upon a breakout of this multiyear basing formation it has been forming since 2013. This makes for a potential gain of 46% in price. Now if we apply a Fibonacci extension to get our second target we take the low from 2002 to the high in 2011 and bring it back down to the low in 2015. This gives us an upside price target of $2681 an ounce. Based at the current price of gold we could see gold rally 106% over the next year or two. Platinum is the second best metal for short-term and long-term gains from 2019 and beyond. Looking at the monthly chart you can see the previous high in 2008 was around $2300 based on the current price if we get a move to the previous high it provides a 176% potential gain. Also, notice how the price is testing the major support level forms in 2008 this could act as a very significant double bottom in price as well. Using Fibonacci extensions we take 2001 low up to 2008 high and back down to the recent low in 2018 or 2009 both are the same price this projected price gives us an upside target of $2659 an ounce. Based on the current price of platinum that gives us the 221% potential gain over the next couple of years. The number one precious metal to own in 2019 and beyond is silver. Based on the previous high in 2011 and looking at the current price of silver there is a potential upside gain of 226%. Also, notice how silver is putting in a potential double bottom from the 2015 lows it also goes all the way back on the chart to 2006 through 2010 as a key support zone. Much like platinum, silver is at support and could very easily start a new mega-rally at any time. Using a Fibonacci extension, we can get our second target for silver based on 2002 low and 2011 high along with the 2015 bottom. This gives us a $59 price target. 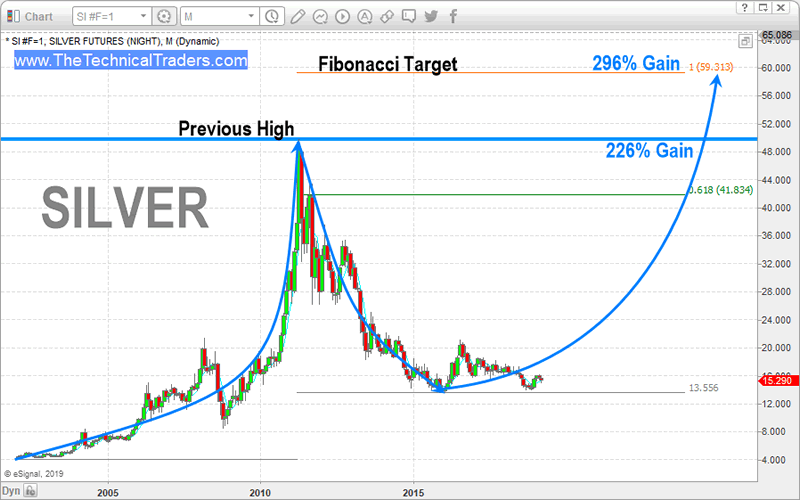 With the current price of silver trading at $15 an ounce, there is an upside target of 296% potential gain over the next couple of years when silver starts its next bull market. In fact, I recently purchased a couple more silver bars from SDBullion to add to my silver stacks because I like the potential. In short, I feel precious metals should be a part of everyone’s portfolio as a long-term hedge and investment. I see precious metals as an insurance policy in case all hell breaks loose in the financial system and we need to fall back to something with physical value for a short period of time. With that said, I am a firm believer that you should never overload in one particular investment or asset class. But I do feel certain metals should have a heavier weighting based on their current potential. The more upside potential the more of that metal you should own shares or physical bullion. How should you invest and trade precious metals? There are a few ways to own metals as a trader and investor. You can own physical bullion rounds or bars and I don’t recommend coins simply because you pay a premium for a design and if metals ever do become a true currency the added value you paid for a design stamped in the metal will be tossed out the window and you lose that value as price will be based purely on weight. If you want to join a group of professional traders, researchers, and friends, take a look at our trading newsletter to learn how we can help you find and execute better trades each month. We believe 2019 and 2020 will be incredible years for skilled traders and we are executing at the highest level we can to assist our members. In fact, we are about to launch our newest technology solution to better assist our members in creating future success. Our team has 53 years of experience in researching and trading makes analyzing the complex and ever-changing financial markets a natural process. We have a simple and highly effective way to provide our customers with the most convenient, accurate, and timely market forecasts available today. Our stock and ETF trading alerts are readily available through our exclusive membership service via email and SMS text. Our newsletter, Technical Trading Mastery book, and 3 Hour Trading Video Course are designed for both traders and investors. Also, some of our strategies have been fully automated for the ultimate trading experience.